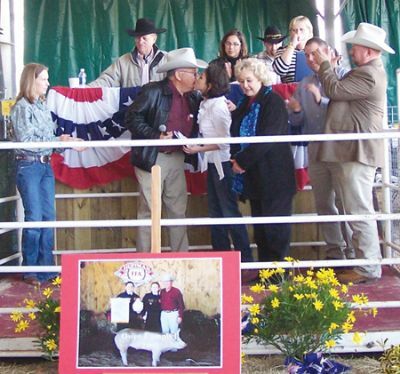 HUFFMAN  The Huffman Livestock Show and Carnival this year proved successful in the largest crowd attending and the rapidity with which bids rose. This year the initial ceremonies recognized Owen Campbell for his contribution to the Huffman FFA over the last couple of decades. Campbell was awarded a a sculpture and and warmth for his contributions. Campbell pointed to the programs contribution to the work ethic of participants. 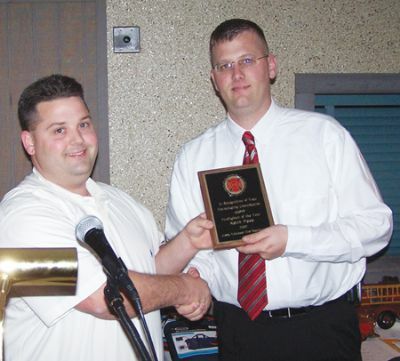 CROSBY  The bravado and dedication required to rush into a flaming building as everyone else is dashing to get out was subdued under the jovial countenance of local heroes last Jan. 26 at the Crosby VFD 2007 Appreciation Banquet. Randy Foster announced that two five acre lots were purchased by ESD#80 for future fire station developments last year. One is located beside Station 2 in Newport, the other is located at the corner of Highway 90 and Kenning Rd. A new pumper has been ordered to replace the 1983 Grummond pumper to be delivered in August or September. An architect is currently designing the new station developments. Last years was an extremely successful year for the acquisition of equipment in Crosby. The Crosby VFD has been dedicated to lowering the ISO Rating for Crosby for years not only to improve the communitys safety but also to lower insurance costs for homeowners. This year the purchase of new Bronto aerial devise. The department not only received a new HAZMAT trailer to deal with dangerous chemicals. The ESD#80 bought a new utility truck to pull the trailer. Chief Alan Kulak announced the successes of Crosby VFD in raising scholarships. Booster #82 is being replaced by a newer model this year. Bob Roberts of the Crosby VFD Fire Board announced that Briskets will be cooked at Crosby High School this Saturday from 11 to 5 the briskets will be sold for $40 each to benefit a local student. Thanks to a grant chased after and received from the Texas Forestry Service four of five stations now are equipped with Jaws Of Life. Rescue Stokes and Rescue Randy has been bought to help train firemen in rescue training. Thirteen more sets of fire gear has been added to the department. A new water rescue boat was taken this month. Raymond Wilkinson was recognised in abstencia for 15 years of service, he had to work. Bob Roberts Sr. was recognised for 25 years of service and Randy Foster was recognised for 30 years of service. Training Officer Chris Black presented an amusing and highly animated satire of mistakes made in 2007. CROSBY– Cold winds and rains did not stop a group of diehard cookers from going out to have a good time while raising money for a good cause. On Friday and Saturday night the Crosby-Huffman Go Texan Committee of the Houston Livestock Show and Rodeo held their annual cookoff at the American Legion Hall. This year 12 teams competed in the areas of fajitas, open dish, chicken, beans, ribs, brisket and showmanship. Judging began Friday night with fajitas and continues all day Saturday, with briskets reaching the judges at 5 p.m. The big winner of the night was the Bayou City Lagniappe Cookers. The team won first place in Beans, Open Dish, Ribs and Brisket and took a third in chicken. The Cypress Boys won first in fajitas while Smoking Hat Cookers took top chicken. The Redneck Girls won the showmanship award. 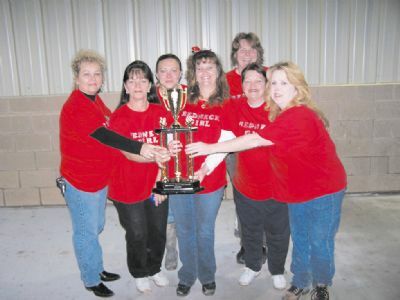 The cooking teams were not the only winners Saturday night. Proceeds from this and other fundraisers are returned to the community in the form of HLS&R scholarships for graduating seniors from Crosby and Hargrave High Schools. When can you start tapping into sources of retirement income? When you retire, it would be convenient if all your expenses were to retire as well. But they wont. In fact, youll likely need between 80 percent and 100 percent of your pre-retirement income to maintain your standard of living in retirement. And you may even need more, depending on what you plan to do during your retirement years. So, well before you retire, ask yourself a couple of key questions: Where will the money come from? And when can I get at it? Lets take a look at some of your likely retirement income pools, along with the rules governing withdrawals from these sources. 1. You leave your employer when you are at least 55 or you become disabled. 2. You take a series of equal periodic payments, made at least annually, for your life or life expectancy. 3. You roll over your 401(k) withdrawals into an IRA. Of course, you may not want, or need, to tap into your 401(k) at either age 55 or 59-1/2. If thats the case, you can leave your account alone and, hopefully, watch it continue to have the potential to grow. But you will have to start taking withdrawals when you reach 70-1/2, if you havent already done so. *IRA – As is the case with your 401(k), you will, in most cases, have to pay a 10 percent tax penalty if you take distributions from your IRA before age 59-1/2. And you must begin taking required minimum distributions from a Traditional IRA once you reach 70-1/2. If you have a Roth IRA, you face no mandatory distribution rules, so you never have to touch the money, which means it can potentially grow tax-free for years. To most effectively incorporate your 401(k) and IRA withdrawals, and your Social Security payments, into your retirement income, youll need to consult with your financial advisor. Also, to make sure youre not adversely affecting your tax situation when you start taking these withdrawals and payments, talk to your tax advisor. But dont wait until youre almost retired to start planning for it. Your decisions on when to start taking withdrawals from your various retirement accounts are usually irrevocable – so youll want to get them right the first time. 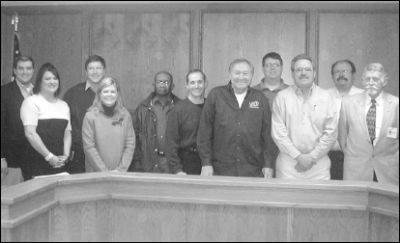 CHAMBERS COUNTY– The Chambers County Mayors Coalition welcomed a group of history buffs to their meeting last week at the Cove City Hall. Addressing the Mayors was Bob Wheat, Chair of the Chambers County Historical Society; Kevin Ladd, Director of the Wallisville Heritage Park; and Heather Hawthorn and Sarah Cerone, representing the Chambers County Sesquicentennial Committee. 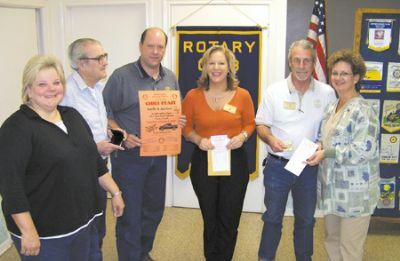 Wheat gave a brief history of Chambers County from some 2000 years ago to the present. He invited the Coalition to visit and utilize the Countys Historical Museum and Archive Building for a future meeting. Ladd spoke of the activities of the Wallisville Heritage Park which is privately funded and houses a museum and a genealogy library. He likewise invited the Coalition to utilize the Parks meeting facilities which include a one room school building located adjacent to the museum. Hawthorn and Cerone reported on the upcoming events that are scheduled for the 150th birthday of Chambers County. The kick-off event will take place on the East Courthouse Steps on Feb. 11 at 11 a.m. and will include a hot dog lunch served near the Courthouse. Next, a Birthday Bash will be held on March 29 at Fort Anahuac Park starting at 10 a.m. It will be an all day family affair with activities for all ages. It will conclude with a gigantic fireworks display at 10 p.m. and a street dance until midnight. Ryan Larue, District Coordinator for Senator Tommy Williams, spoke briefly about recent legislative activity and advised the Coalition that should they need legislative action during the next session in 2009, to contact the Senators Office for assistance. The Coalition also reappointed Rita Standridge to the Board of Directors of the Gulf Coast Waste Disposal Authority. Mrs. Standridge currently serves as the Vice Chair of the Board. 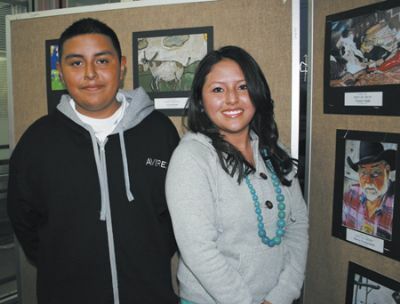 Siblings Cristian, left, and Mayra Torquemada were two of the 10 secondary school winners in Goose Creek CISDs annual Rodeo Art Show. They were among those honored at the Rodeo Art reception on Jan. 15. Cristian, an eighth grader, won Best of Show in the junior school category. He is the student of Carla Griffin at Highlands Junior School. Mayra, a senior, won a Special Merit award in the high school division. She is the student of Roberta Sturges at Ross S. Sterling High School. HUFFMAN  Beginning Thursday, January 24, Hargrave High School will become a flurry of activity due to the start of a Livestock show as animals weigh in for judging, spirit will be high as Hargrave recently returned from the Houston Livestock Show & Rodeo with numerous successes in art. The following day Hargrave will have a carnival on campus that will last until Saturday, January 26. This is to be the first time for a carnival on the campus. A buyers diner will begin Saturday, January 26 from noon until 2:00 p.m. The diner will be followed by the Huffman FFA Livestock Show commencing at 2:30 p.m.
HIGHLANDS Almost everyone in town knows Bettye Rosser. Maybe you have been doing business with her for the last 6 years at Woodforest Bank. Maybe you have dealt with her at Gerlands Supermarket the 17 years before that. Maybe you remember her from her days at Ronnies, or Lewis & Coker in Baytown. Maybe you have read some of her poetry, in the Star-Courier or at her Poetry Club, the IWA in Pasadena Town Square. Maybe you have seen her in church, at Joy Lutheran on Beltway 8, or before that at Grace Lutheran in Channelview. Whew. I think you get the idea. Bettye has done a lot of things in her lifetime, and now she deserves a rest. What will she do? She and her husband Dale will travel some, perhaps to Rockport for some fishing and bird watching. And she will catch up on her reading, and some poems that are waiting to be written. She is president of the IWA, you know, the Inspirational Writers Alliance. And she can visit family. Lots of family. Bettye has 5 living and one deceased children. You know many of them. Lisa Vickers, Pastor Beau Rosser, Mark, Tinker and Sharlon. And then there are the 18 grandchildren, and 5 great grandchildren. Born in Monticello, Arkansas, she and her husband came to Texas in 1973, and bought a home close to Baytown, after their cotton mill closed in Arkansas. She has worked at the bank since 2001. Her husband is retired now, from Hy-Vac Corp., where he supervised environmental construction. 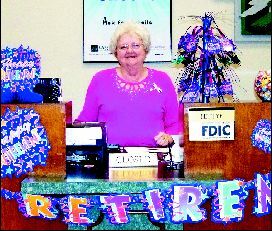 Bettye said she will miss her co-workers and customers, who held a nice day-long party for her last Friday, as she finished up at Woodforest Bank in Highlands. And you can be sure that we will miss Bettye, too. 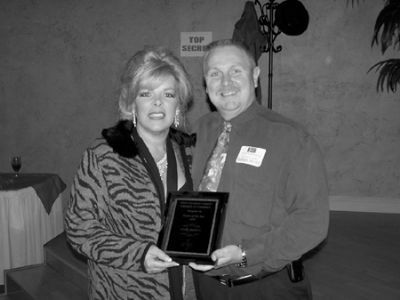 BAYTOWN– She is a local business owner and active member of the community and now Holly Jackson is the West Chambers County Chamber of Commerce Person of the Year. Jackson, who not only owns the Liquor Hut south of Mont Belvieu, but holds another full time job, was recognized Tuesday night at the chambers annual awards banquet. Throughout 2007 Jackson showed a willingness to do whatever was needed to help the chamber succeed in its mission to serve the community. In addition to taking leadership roles in nearly every project, she was one of the co-chairs of the Diva Evening. A first of its kind for the chamber, this fundraiser brought in over $15,000. Jackson was not the only one honored Tuesday night. The lifeblood of the chamber is its business support. Local businesses not only provide financial support but personnel and expertise for its projects. This years Small Business of the Year is Bookwork Solutions and owner Michelle Gilmore. Turner Industries, represented by Joey McWilliams, was named Corporate Business of the Year. Each year the three municipalities that are within the chambers service area: Mont Belvieu, Beach City and Old River Winfree, present a Volunteer of the Year award. The years Beach City Volunteer of the Year is Patrick Patty Mac McDonald. A medic and volunteer firefighter for the past 17 years, he has served the Beach City VFD, Cove EMS and Trinity Bay EMS. Simple Simons Pizza owner Dennis Demura was recognized for his community service with the Old River- Winfree Volunteer of the Year award. McWilliams was honored by the City of Mont Belvieu as their Volunteer of the Year. Mayor Nick Dixon said that McWilliams expertise had been an invaluable asset to the Planning & Zoning Committee. In keeping with the Spy theme, keynote speaker for the banquet was Professor Jim Olson. Olson served over 30 years with the CIA. CROSBY The Crosby Fair & Rodeo Board announces an exciting lineup of after-rodeo concerts for this coming June including Kevin Fowler, Jack Ingram, and Aaron Watson leading for Jason Boland. This year the fun begins on Friday, June 6 with the Barbecue Cook-Off Party with concert and continues on the following day with the Rodeo Parade and Cook-Off. After the Thursday, June 12 sport of Professional Rodeo inside the arena, Kevin Fowler plays fresh from his concert at the Houston Livestock Show and Rodeo. Friday, June 13 Jack Ingram will perform as the last act. A preceding act has yet to be booked. The Saturday show will feature Aaron Watson followed by Jason Boland and the Stragglers. Each of these acts has history here in Crosby. This will be the fifth time Kevin Fowler has played here. He is considered a local favorite who excites many honky-tonk Western style fans. This is a consecutive years for Watson and Boland. Kevin Fowlers new single, Best Mistake I Ever Made gets respectable air-time and is about 180 degrees from last years Long Line of Losers. The Losers release pokes fun at some annoying folks in his Austin neighborhood and Best Mistake is much closer at home and heart. Both of the songs exemplify Fowlers themes for bawdy humor and genuine feelings. Mostly, Fowler packs the concert venues due to his rowdy anthems like Beer, Bait and Ammo. His music is a jubilant hybrid of Southern Rock and honky tonk Country Western styles. The eclectic seems aimed at a sophisticated audience that is equally at home watching MTV or CMT. In presentation, local audiences will find Kevin Fowler a totally country Texas Rebel with pearl buttons and a big ole hat exemplified in his songs, The Lord Love A Drinkin Man and Loose, Loud and Crazy. The stagecraft will suggest a big production rock show and the cheering fans – fun. Texas-Revolutionary Jack Ingram, a no-hat act born on the first day of 1970, toured Dallas and Houston as a troubadour before he earned his breaks from out of the road houses and honky tonks. In his twenties, his Beat Up Ford Band produced two albums that were large locally and gateway to become opening act for Merle Haggard and Mark Chesnutt. He is performer of high vocal quality who conveys emotion in the mood in which it strikes the listener, as a writer. A compliment to Brooks and Dunn, Brad Paisley and writing songs, while performing with Sheryl Crowe, there is depth here. Warner signed him in 1996 Livin or Dyin was the result. In 1999, Ingram released his fifth roots rock album, Hey You. Three years after Hey You he wrote Electric Young Man with many of his earliest songs given professional dressing that the songs deserved, then Live at Gruene Hall: Happy Happy in 2004. A live recording featuring two studio singles, Live Wherever You Are, was released in 2006. The album also earned him airplay and media attention nationwide. Then came Honky Tonk Kid with guest vocals from his inspiration, Willie Nelson. Aaron and the Orphans of the Brazos captured their energetic live set in 2005 with Live at the Texas Hall of Fame. In 2006 he released San Angelo. Now that everyone has forgotten the Outlaw Country Music with origins in Hank and developed by Willie and Waylon, along come some Oklahoma Outlaws that are determinedly Country but completely modern, using heavy overtones and vocal nuances. Recording a concert in the spring of 2002, they released Live at Billy Bobs Texas that fall. In 2004, some maturity had developed and Somewhere in the Middle was released. Bourbon Legend bust upon the music scene in 2006. An observer at the concerts notices the crowd swinging, cheering and singing along. They also see that the female members of the audience are looking at steel, lead/rhythm guitarist, Roger Ray or Brad Rice on drums, Grant Tracy, on bass, and Noah Jeffries on every type of string instrument. Bolands intonations are moving but his face has the effect of a train wreck, one just cannot turn away, even if they definitely want to look elsewhere.